ONE PIECE, by Oda Eiichirô, 1997 onwards. © Eiichiro Oda/SHUEISHA. Nakamura Hikaru (b. 1984), Saint Young Men (Saint Oniisan). 2016. © Hikaru Nakamura / Kodansha Ltd.
Manga are Japanese comic books or graphic novels with a twist, serialised in newspapers and magazines. Originating in Japan, manga now has fans across the globe. Manga is immersive storytelling through pictures, where images rule supreme. The Japanese characters for manga translate as ‘pictures run riot’ or ‘pictures unbounded’. There is less reliance on text, and narrative is created through expressive line drawing along with the visual development of individual characters. It is manga’s visually immersive quality that makes it so popular. Manga’s roots are international and can be traced back as far as 1200 AD, but the form as we know it today first emerged from serialised cartoon strips in magazines and newspapers by the 1920s. The popularity of Manga developed throughout the 20th century and it now boasts a global reach. The manga phenomenon is still expanding and includes animation (known as anime in Japan), art, fashion, graffiti, as well as digital multimedia and gaming. 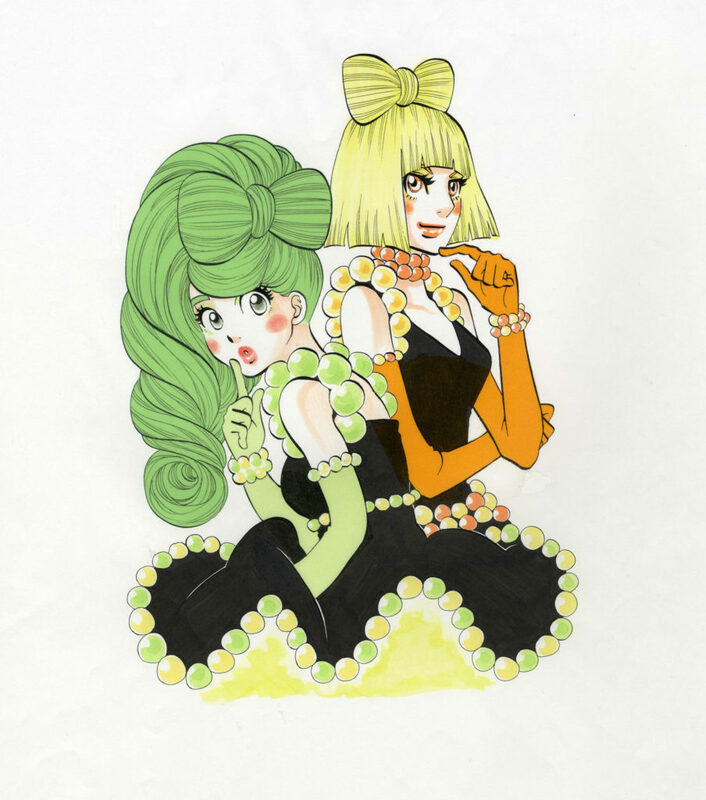 Read our blog post to find out more about the history of Manga. Manga is a multi-billion-pound industry, super-fueled by its readers and viewers. It is immensely popular with people of every age in Japan and increasingly across the world. With hundreds of genres, from sports to love, and from horror to sexual identity, there is a manga for everyone. ONE PIECE, by Oda Eiichiro, created from 1997 onwards, is the best-selling manga of all time. 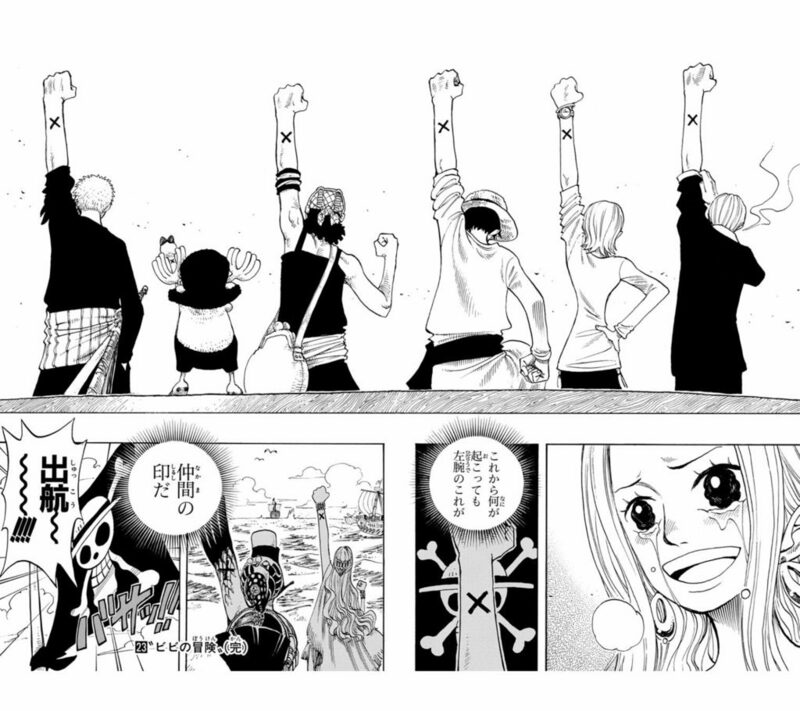 © Eiichiro Oda/SHUEISHA. A particularly popular example of Manga is ONE PIECE, by Oda Eiichiro, which tells the adventures of a boy whose body has become rubberised after eating ‘Gum-Gum fruit’ and who travels the world on a pirate ship in search of priceless treasure, the legendary ONE PIECE. Created for the publisher Shueisha in 1997, it is still going strong and has filled 91 individual volumes (tankōbon). ONE PIECE has over 440 million books in circulation worldwide, making it the best-selling manga of all time and earning a place in the Guinness Book of World Records. How is manga related to anime? Originally printed on paper in newspapers, then magazines, and single volume books, manga is now going digital and is available in many different formats – and almost all languages. If popular, a manga may become the basis for an anime series or film. Golden Kamuy, by Noda Satoru, created from 2014 onwards, is a hugely successful manga – and now a popular anime translated into English. © Satoru Noda/SHUEISHA. Golden Kamuy is a relatively new manga that has published more than 9 million copies and is now a popular anime translated into English. Written by Noda Satoru, it is a dramatic action tale that takes place in the early 1900s on the northern island of Hokkaido. 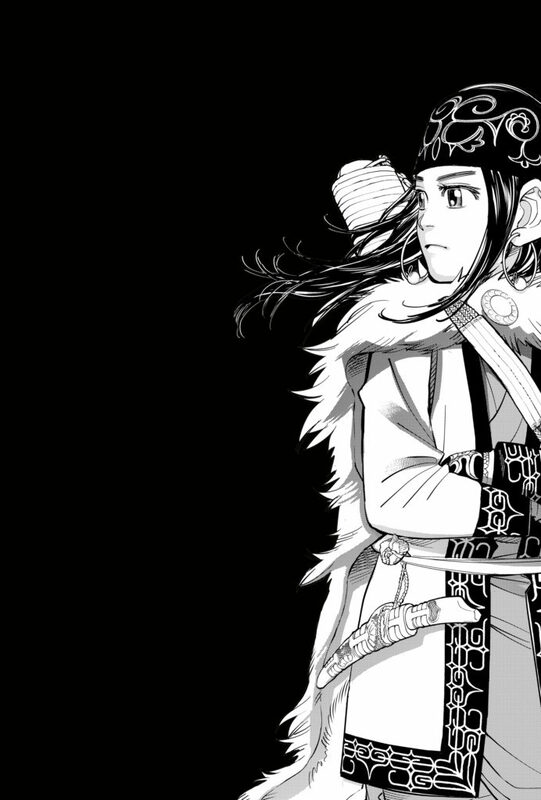 The hero, Sugimoto teams up with a local Ainu girl named Asirpa to attempt to find gold stolen from the indigenous Ainu community in a deadly race with the Imperial Japanese 7th Division Army and other assorted and often unsavory characters. Noda, a Hokkaido native himself, told me how he researched all aspects of the manga including eating the food portrayed. Both the manga and the anime are gripping, as well as beautiful and educational – you learn about Hokkaido and Ainu customs as you become absorbed in the story. Manga is produced in many different formats, now including those made for mobile devices, which lets you adapt how you wish to read it (keitai manga). Traditionally, manga books are read from back to front and from the upper right corner to the lower left corner of a page. Formats include the simple four panel manga (yonkoma), mostly seen in newspapers or on mobile phones, magazine compendiums of serialised manga artists (shūkanshi, gekkanshi), and individual books of specific manga or authors (tankôbon). There are also fanzines or independently published and fan-created comics (dōjinshi). Giga town: album of manga symbols is based on the 12th-century Handscrolls of Frolicking Animals (Chōjū giga) and helps you to understand the grammar and symbols in manga. © Fumiyo Kono/Asahi Shimbun Publications Inc. The brilliant manga artist Kono Fumiyo has recently published a book called Giga Town: album of manga symbols in order to help us understand the grammar and symbols embedded within manga. Drawing animals based on the 12th-century handscroll called Chōjū giga emaki, Kono makes these manga symbols, called manpu, come alive. Here we see her heroine Mimi-chan, a young white rabbit, racing a turtle that could be straight out of Aesop’s Fables. They help explain the meaning of the use of spirals in manga – namely to show something spinning, either movement or one’s head through dizziness. Blue Giant Supreme, by Ishizuka Shinichi, created from 2016 onwards, tells the tale of an aspiring saxophonist and includes visualised musical expressions. Manga images are supplemented by sound effects that include onomatopoeia and imagined sounds (giseigo and gitaigo), which are important components of the Japanese language. 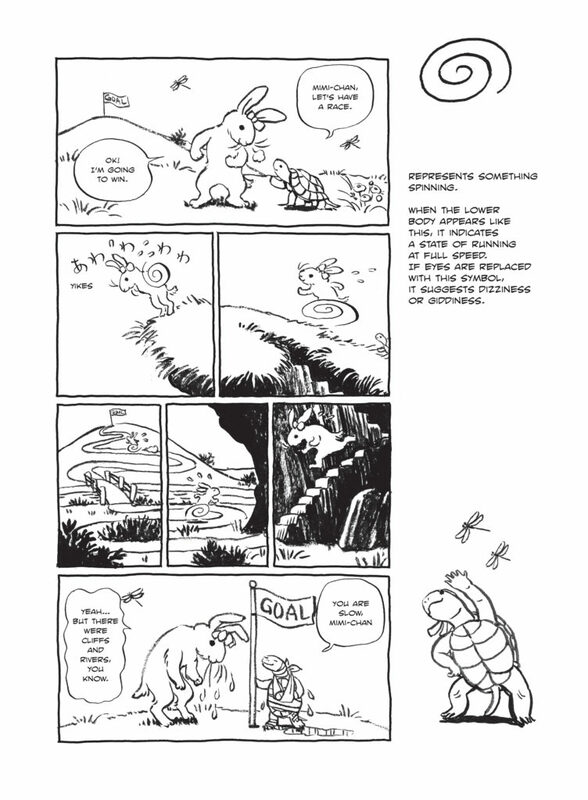 These sounds are drawn into the composition, enhancing their effect by making them part of the image rather than resting the words on top of the image or in a bubble. 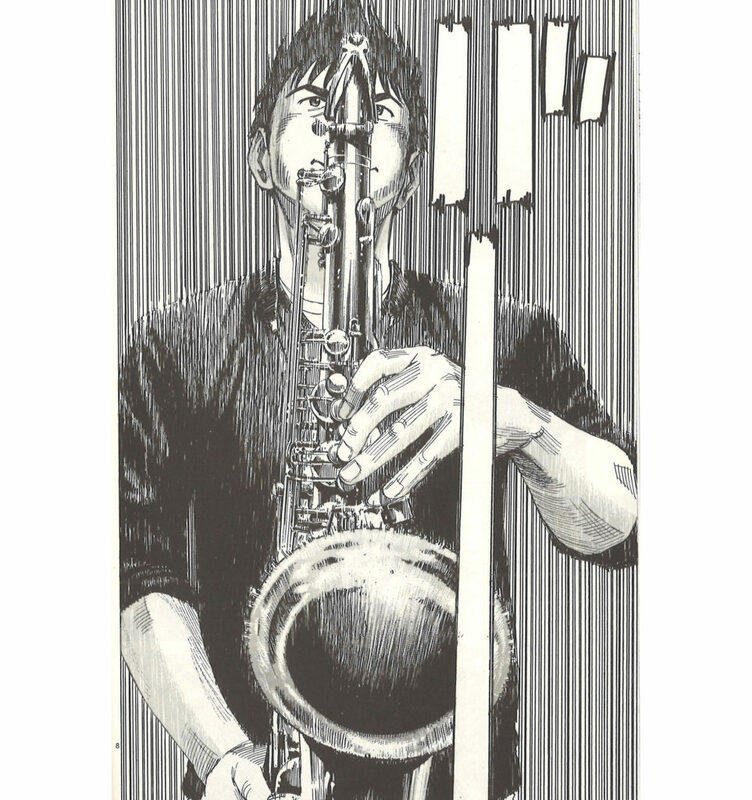 Blue Giant Supreme, a compelling manga created by Ishizuka Shinichi, tells the tale of saxophonist Miyamoto Dai, who travels to Germany to pursue his dream of becoming one of the world’s best jazz saxophonists. The music scenes show manga at its best – the reader can almost hear the sounds through the vertical tightly drawn lines and sound effect symbol (in katakana, a Japanese phonetic system) reading ‘baaaaaaa’. 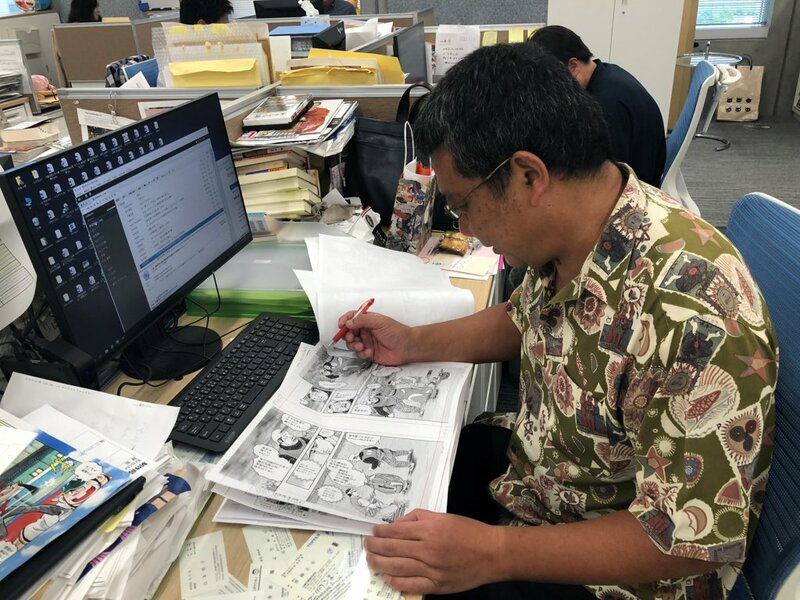 Nakaguma Ichirô, the senior manga editor at Shogakukan, is seen here checking the manga offer before approving it for inclusion in Big Comic Original magazine. Many large publishers in Japan derive a significant portion of their profits from manga. It is big business, the turnover of the domestic manga industry in 2016 was approximately £3 billion. Four of the top publishers who also control a large share of the manga market are Kodansha, Hakusensha, Shogakukan and Shūeisha. They are constantly competing, publishing rival magazines and trying to keep popular manga artists. 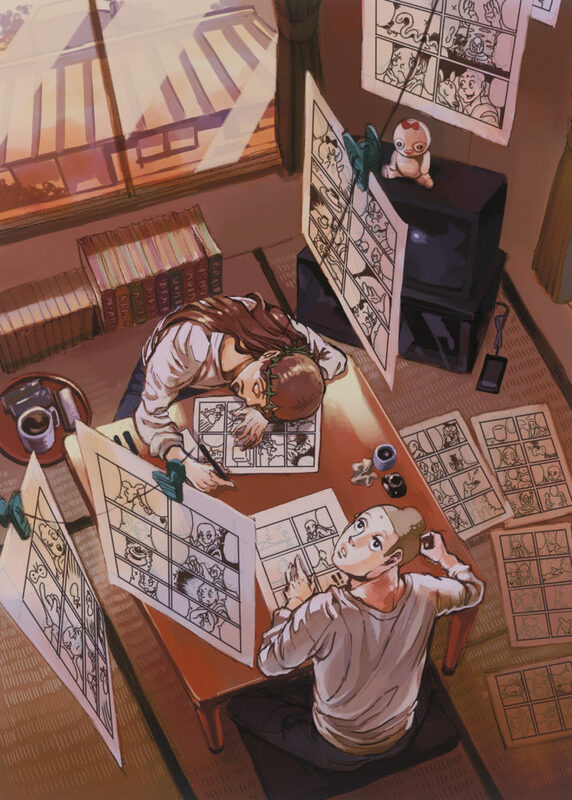 Editors are assigned by the publishing houses to specific manga artists and play a key role in developing manga stories in collaboration with the artists. They work closely with individual artists and often help with content as well as managing production schedules and overall formatting and conducting basic research for the artist on the theme or images depicted. What’s the difference between boys’ and girls’ manga? Different strands of manga have evolved for male and female audiences. Shōnen manga, aimed at young men, tends to focus on action and adventure whilst shōjo manga is aimed at young women, and focuses on romance and relationships. However, there is increasing crossover in plot lines, subject matter and gender of protagonists. Shōjo manga can includes stories of male homosexual relationships, known as ‘boys love’ or BL. Higashimura Akiko (b.1975), Princess Jellyfish (Kuragehime). 2008–17. © Akiko Higashimura / Kodansha Ltd.
Higashimura Akiko is a brilliant young shōjo manga artist. Heavily influenced by shōjo manga from the 1980s, she is known for titles aimed at young women. They include the award-winning Princess Jellyfish, which has been turned into an anime series and is currently being translated into English. Princess Jellyfish was published as a series by Kodansha as a result of demand from fans. 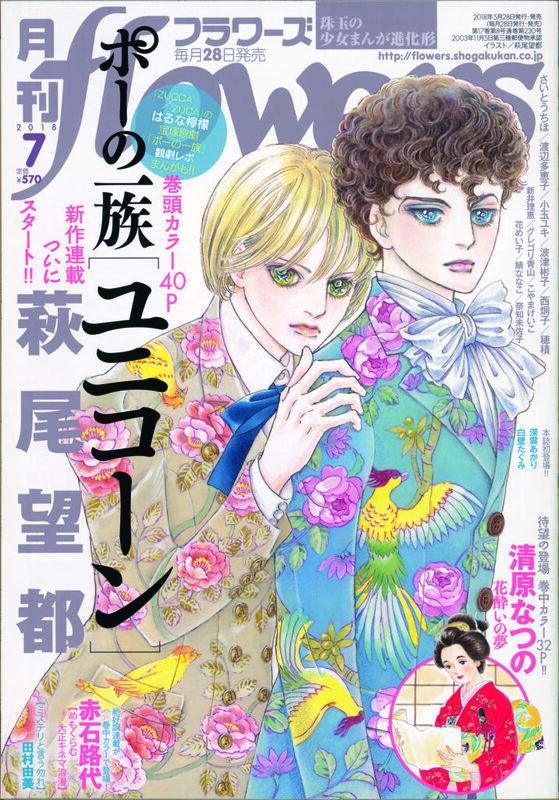 Poe Clan, on the cover of flowers magazine, was created in July 2018 by Hagio Moto, who is a pioneer in shōjo (female) manga. © SHOGAKUKAN INC.
Hagio Moto is a pioneer in shōjo manga – and a master of including emotional depth and sophistication in her story lines. Among her manga classics is the Poe Clan series that continues to thrill after 40 years. The story revolves around a secret family of vampanellas (vampires) in 18th-20th century Europe, with beautifully drawn images that draw you into a hidden and dangerous reality. In the beginning of 2018 and she was honoured with a rare Takarazuka Grand Theatre production of this work, much to Hagio’s large fan base’s delight. And from May 2018 the manga shōjo magazine flowers, whose cover you see above, started publishing her new story line on the theme, picking up 40 years after the series ended – watch this space! Discover more about the world of Manga in our ground-breaking exhibition.